Ice Cream Cakes come in many sizes, but my favorite is these individual cakes. They are just too cute. There are three parts to these cakes. First, the cake. Since Ice Cream Cakes are popular birthday cakes, I decided to use a Sprinkle Cake with its bright and cheery dots of rainbow colored candy sprinkles. Next, I layered the rounds of cake with a delicious strawberry ice cream, although feel free to use another flavor. 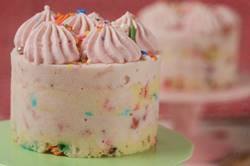 Finally, each cake is topped with swirls of raspberry flavored whipped cream and even more candy sprinkles. To assemble the ice cream cakes, you can use 12 - 2 1/2 x 1 1/2 inch (6 x 4 cm) round ring molds or a 12 cup muffin pan. Just be sure to lightly oil the ring molds. And if using a muffin pan, lightly oil each muffin cup and then line each cup with plastic wrap. This makes it much easier to remove the cakes from the molds or muffin cups. Also, don't throw away any leftover cake and crumbs you may have. Instead make some Cake Pops and there is a recipe and video on the site showing you how to make them. Sprinkle Cake: Preheat your oven to 350 degrees F (180 degrees C) and place the oven rack in the center of the oven. Butter, or spray with a non stick vegetable spray, an 18 x 13 inch (46 x 33 cm) baking sheet. Line the bottom of the pan with parchment paper. In a bowl, sift the flour with the baking powder and salt. In the bowl of your electric stand mixer, fitted with the paddle attachment (or with a hand mixer), beat the butter until soft. Add the sugar and vanilla extract and beat until light and fluffy (about 3 minutes). Add the eggs, one at a time, beating until incorporated. Scrape down the sides and bottom of the bowl as needed. With the mixer on low speed, alternately add the flour mixture (in three additions) and the milk (in two additions), beginning and ending with the flour. Gently fold in the sprinkles. Spread the batter evenly into the pan, smoothing the top with an offset spatula or the back of a spoon. Bake for about 15 - 18 minutes, or until a toothpick inserted in the center of the cake comes out clean (the cake will spring back when lightly touched in the center and you will notice that the cake is just starting to pull away from the sides of the pan). Cool the cake in the pan on a wire rack for about 10 minutes. Then place a wire rack on top of the cake pan and invert, lifting off the pan and gently peeling off the parchment paper. Once the cake has cooled completely, wrap in plastic wrap and refrigerate for about one hour or until firm. (This makes it easier to cut out the rounds of cake.) (The cake can also be frozen for up to a month). Next, using a 2 1/2 inch (6 cm) round cookie cutter, cut the cake into 24 rounds. Place one cake round in the bottom of each ring mold or muffin cup. Filling: Place the strawberry ice cream in the bowl of your electric mixer, fitted with the paddle attachment, and beat on medium low speed until the ice cream is soft enough to spread easily, about 10-15 seconds. (Can also use a wooden spoon.) Put the ice cream in a pastry bag fitted with a 1/2 inch (1 1/4 cm) plain tip. Pipe a layer of ice cream on top of each cake round. Cover the ice cream with another round of cake, pressing down gently to compact. Then pipe another layer of ice cream. Cover with plastic wrap, and place in the freezer until the ice cream has become firm (about two hours). Frosting: In the bowl of your electric mixer, fitted with the whisk attachment (or with a hand mixer), whip the cream until soft peaks form. Add the Raspberry Jam and whip until cream is of piping consistency. Place the whipped cream in a piping bag fitted with a star tip. (I used a Wilton 4B). Remove the ice cream cakes from the freezer and remove them from their molds and place on a baking sheet. Then pipe rosebuds or swirls on top of each cake. Return the cakes to the freezer to set (about two hours or up to five days). To Serve: Remove the cakes from the freezer about 15 minutes before serving. Garnish each ice cream cake with sprinkles, if desired. Makes up to 12 - 2 1/2 inch (6 cm) ice cream cakes.